The bus goes from Pioneer Village Station to Keele Station and is ranked among the five worst performing routes by the Toronto Transit Commission (TTC). The midday 41 was the most overcrowded route on the TTC in 2016. It travels almost exclusively through neighbourhoods with average incomes considered “low” to “very low” based on 2016 census data. Residents in these neighbourhoods are more likely to take public transit on average than others across Toronto. If they live north of St. Clair Ave. West – as most of them do – these residents are also much more likely to face commutes of over an hour to work every day. The struggles faced by these families are not limited to transit. The majority of neighbourhoods on the route are more likely than average in Toronto, to have poor housing conditions. There is also no shortage of education issues in schools along the route. In the past year, workers at both the post-secondary institutions there – Seneca College and York University – were on strike. Both were forced back to work by the Ontario government, with the Wynne government and the Ford government taking turns to enact the same anti-worker policies. At the elementary and secondary level, four schools on the route – concentrated around Keele and Eglinton – are under review to be closed due to under-enrolment. Over the past eight months, members of the Toronto-based Action Keele campaign have become quite familiar with the bus stops along the 41 Keele route. We have been putting up posters, tabling, handing out flyers, conducting surveys and passing out petitions to hundreds of bus riders. We have been doing this while standing outside at bus stops, every week, in the summer sun, the fall winds and the winter blizzards. 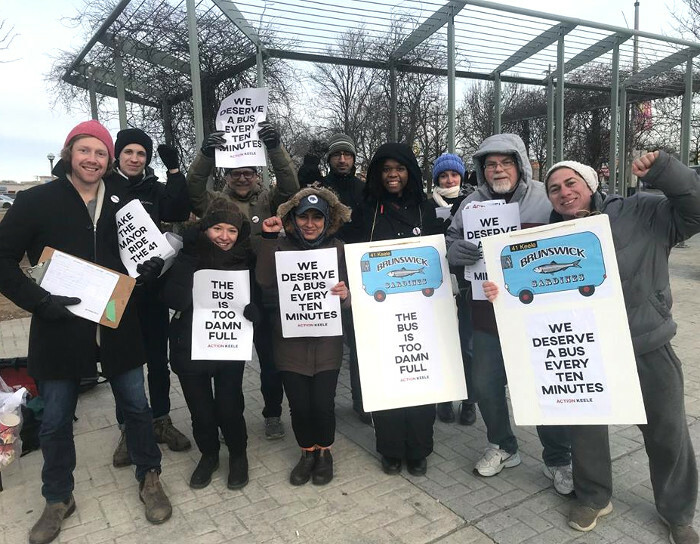 We have organized speakers’ panels along the route about public transit struggles, planned and carried out canvasses with riders of the 41 bus, and held meetings with bus drivers to hear about their struggles. Our short-term goal is to build pressure for much-needed service improvements on the 41 Keele bus route. Transit is not the only issue faced by the residents along Keele street, but it quite literally connects different aspects of their lives together – home, work, school, childcare, groceries, friends, etc. The quality of this connection; how frequent and reliable the 41 is, has an impact on how smooth or stressful in-between time is for the families of the route. Waiting over half an hour in the cold for the bus – as many riders of the 41, including ourselves, have to do, can turn the most mild-mannered of us into grumpy shells of ourselves, especially when the wait is followed by four buses coming at once! During rush-hour, what would otherwise be a twenty-minute car ride can easily turn into two hours on the 41! As we work to understand and organize around transit issues, we are ever-vigilant about other struggles on the route and beyond. So, we are deeply concerned about the hard-right agenda being implemented by Doug Ford’s government. We are involved in efforts to prevent Ford from uploading the TTC subway to the province. But the difficulty we see is that at the present time the calls for putting up a resistance against Ford amount to mobilization and not organizing. There’s a difference. There is an important relationship between mobilizing and organizing. But to mobilize people they need to be organized; there needs to be a base. The people in this base should see themselves as a group. They should have a sense of shared interests and recognize who their opponents are. Mobilization cannot be permanent, but the prerequisite for successful, occasional bursts of mobilization, is a permanent base of organized people. It takes time and a lot of effort to build it, but that is what organizing is about – the hard work between times when people are upset enough to rally around an issue like Doug Ford’s upload of Toronto’s subways. That’s the time when you build and maintain a base of supporters who will be there when we need to talk about the decline of Toronto transit, housing and just getting by in a city marked by extreme wealth, on one hand, and despair, on the other. This is a long-term project. So, while we are collecting signatures and tabling for a fairly limited demand of service improvements, what we are trying to learn is how to do base-building. There tend to be two assumptions underlying thinking which is centred on mobilizing people. First, is the idea that the ferocity of the attack and the urgent need for a push-back is enough to get people to stand up. But when we start with that idea, we grant the decisive power to our opponents – whether they are neoliberal governments or corporate actors. So, it’s when they launch their offensive that we will respond. It is almost as if we are expecting a mechanical process of simple cause and effect: let things get bad enough and you will see a spontaneous uprising of oppressed people. But without a reliable, organized base of determined people, the severity of the attack and the need for an urgent, massive response can actually have a paralyzing effect. Just look at the actions of the Ford government in the past nine months: cuts to all social programs, education, and city government, cronyism, contempt for anyone in need – all while this government cuts its money supply, so that it can cry poor and provide even less for all of us. Despite this, there has been no massive organization to oppose Ford and his administration. We can’t assume that community groups are ready to mobilize for political ends. When we started thinking about organizing along Keele, we wanted to identify and reach out to all community groups up and down the street. We made a list of forty-seven: five are housing co-ops, five are Toronto Community Housing buildings, one is a community health centre, three are libraries, three are non-profits. There are thirty religious institutions. We called each one, introduced ourselves as Action Keele and explained the project of improving the Keele 41 bus service. A few asked for our flyers; none seemed enthusiastic. This was not a surprise, given that these kinds of organizations tend not to be political. We need to start long-term base-building from scratch, because there is a dearth of progressive groups with enough organizers to convince people that they can change a situation that affects them – even if they need to start with something modest like service improvements on the Keele 41 bus route. We need to rethink the approaches taken by the organizations that have traditionally helped people organize, including activist groups and unions. Organized labour would be transformed if it helped people both inside and outside unions develop strong, articulate groups. Among Action Keele’s experiments with organizing is an attempt to connect unionized TTC bus drivers of the 41 route with regular bus riders of the route. 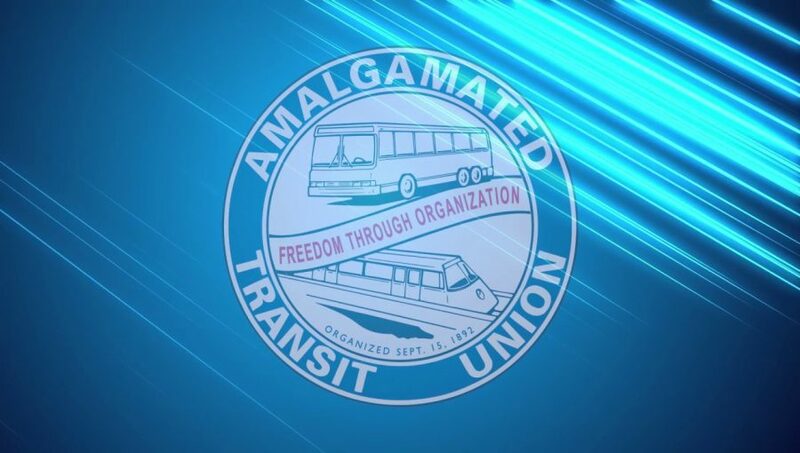 As part of this effort, we have met with a union representative and asked the bus drivers of the route how they think service could be improved. We were pleasantly surprised by the enthusiastic reception. We have some way to go before our demand for better service on the 41 is realized. The approach of going to where people are and building up a project based on their struggles has already been an important lesson for us as organizers. We’re better at talking to people about their problems while suggesting that there are larger political forces at work. Our work is all about learning about what they struggle with and offering our perspective on the power of their rising expectations – even if it is about something as limited as a bus ride. There are two Torontos: one for Bay Street bankers and lawyers, another for working people. As the city’s wealthy elite drive around in luxury cars on their way to fancy restaurants, Toronto’s working people rely on public transit system to bring them to work, visit their friends, and get their children to school. Yet, year after year, public transit is defunded so the wealthy few can keep their taxes low. 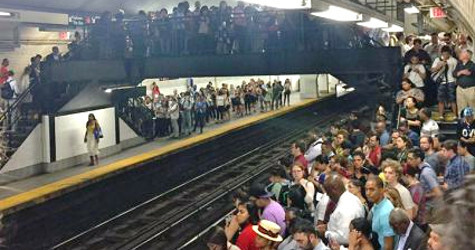 Decades of failed austerity policies have left the transit system overcrowded, over-priced, and inefficient. This is especially the case for working class, racialized, and immigrant communities, such as those along the #41 Keele route. We are here to say that it is time this came to an end. 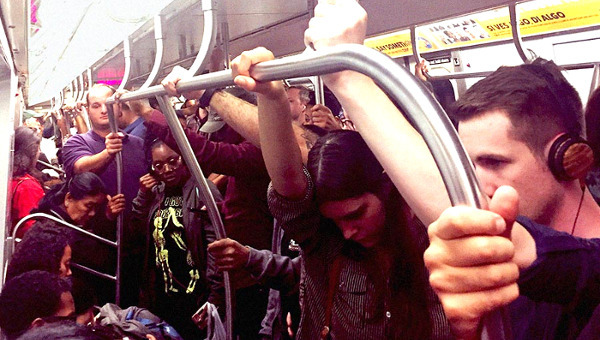 Better public transit means less stress in our lives and a fairer and greener city. It also means a greater number of good public sector jobs. Access to decent and reliable transportation is a right. As such, we demand accessible and dignified public bus service on the 41 Keele route, and for working people across the city. The Action Keele Bus Riders campaign is organizing riders of the Keele 41 route to improve transit service on this line. 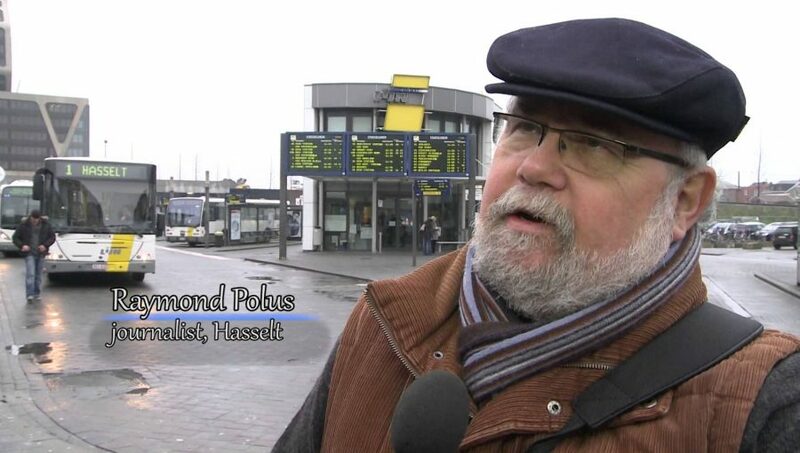 But we also know that fighting back against failed free market policies is not just about bus service. These policies have failed to provide decent incomes and good jobs. They have failed to provide adequate and affordable housing. And they have failed to provide transportation. Confronting austerity requires understanding how all these issues are connected – and organizing to fight back! For more information, check out Action Keele campaign. Sadia Khan is a graduate student at York University with over eight years of community organizing experience in different parts of Toronto.